A Michigan college student saved a drowning squirrel by performing first aid techniques she learned while watching an episode of the NBC sitcom "The Office." 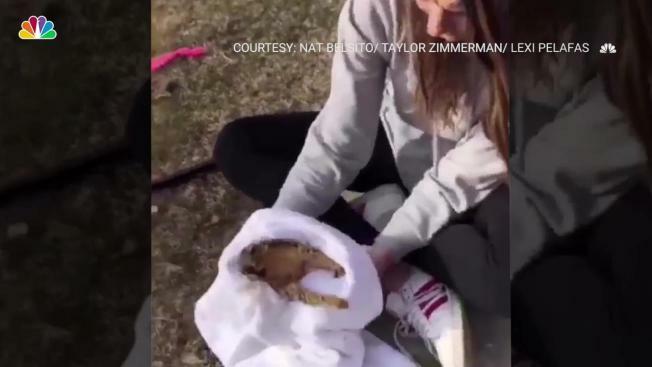 Natalie Belisto, a student at Central Michigan University, rushed out to rescue the squirrel after hearing from a peer that it was drowning in a pond. After another student fished it out, Belisto gave it CPR, took it back to her dorm room and used a blow drier to keep the critter warm. "It was a super cool feeling to know that I saved an innocent life," said Belisto. "I watched a lot of Animal Planet as a kid, but for the CPR part was literally all from that episode in 'The Office.'" After a couple of hours, she and some of her soccer teammates took it outside to release it. "After he ran up the tree we all were screaming and our minds were blown honestly, the whole night we couldn’t stop talking about what happened," Belisto said about the life-saving event. The episode she reffered to was from season five of the hit comedy series, when the staff of Dunder Mifflin learns that a good tip for CPR is to do chest compressions to the beat of the 1977 Bee Gees song "Stayin' Alive."